Abstract. Constraints on the Mediterranean Sea's storage of anthropogenic CO2 are limited, coming only from data-based approaches that disagree by more than a factor of two. Here we simulate this marginal sea's anthropogenic carbon storage by applying a perturbation approach in a high-resolution regional model. Our model simulates that, between 1800 and 2001, basin-wide CO2 storage by the Mediterranean Sea has increased by 1.0 Pg C, a lower limit based on the model's weak deep-water ventilation, as revealed by evaluation with CFC-12. Furthermore, by testing a data-based approach (transit time distribution) in our model, comparing simulated anthropogenic CO2 to values computed from simulated CFC-12 and physical variables, we conclude that the associated basin-wide storage of 1.7 Pg, published previously, must be an upper bound. Out of the total simulated storage of 1.0 Pg C, 75% comes from the air–sea flux into the Mediterranean Sea and 25% comes from net transport from the Atlantic across the Strait of Gibraltar. 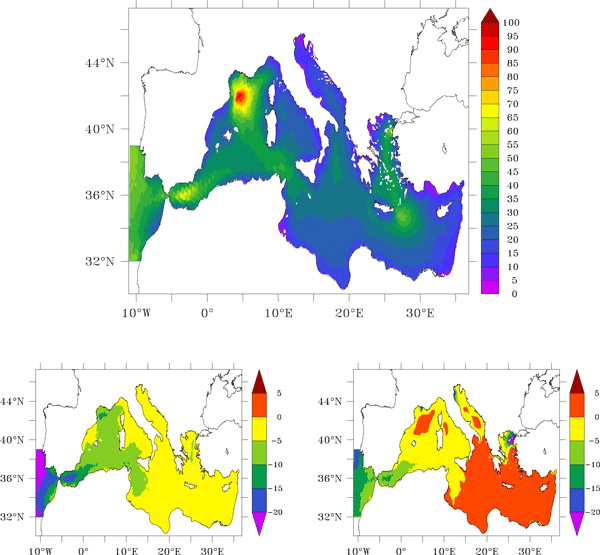 Sensitivity tests indicate that the Mediterranean Sea's higher total alkalinity, relative to the global-ocean mean, enhances the Mediterranean's total inventory of anthropogenic carbon by 10%. Yet the corresponding average anthropogenic change in surface pH does not differ significantly from the global-ocean average, despite higher total alkalinity. 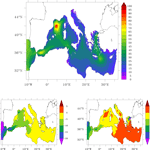 In Mediterranean deep waters, the pH change is estimated to be between −0.005 and −0.06 pH units. How to cite: Palmiéri, J., Orr, J. C., Dutay, J.-C., Béranger, K., Schneider, A., Beuvier, J., and Somot, S.: Simulated anthropogenic CO2 storage and acidification of the Mediterranean Sea, Biogeosciences, 12, 781-802, https://doi.org/10.5194/bg-12-781-2015, 2015.